It’s a question that comes up every now and then, and it’s a fun one to puzzle over… which currently operating tiki bar is the oldest? Your first thought may go to Trader Vic’s, one of the very earliest pioneers in tiki, and a chain that is still operating today… but its earliest locations are now gone, and the oldest one still operating is the London Trader Vic’s, which opened in 1963. Then your mind might turn to a place like Tiki-Ti, which is still owned and operated by the same family that opened it in 1961… but it’s not even the oldest in Los Angeles. Tonga Hut in North Hollywood has it beat by a few years, having opened in 1958. The Mai-Kai in Fort Lauderdale is a couple years older still, it opened in 1956 (and is celebrating its 60th anniversary this year). Bali Ha’i in San Diego opened in 1953. And there are places that are older yet. The Tonga Room in the Fairmont Hotel in San Francisco has been operating since 1945, over 70 years. But! When it first opened it was themed not as a Polynesian paradise, but rather as the deck of a cruise ship headed to the islands. It didn’t turn into the immersive deluxe experience you see today until the ’60s. Which date counts? Don the Beachcomber in Huntington Beach has only been operating for a few years, but the building has a long Polynesian restaurant history. Before it was Don’s, it was the short-lived Kona restaurant, but before that, it was Sam’s Seafood, which operated on the spot for decades, going all the way back to 1923… but it was just a seafood market with a restaurant attached until it was remodeled into a full-on Polynesian restaurant in the 1960s. And if we want to lend weight to an establishment’s opening date over when it turned full tiki, then we have to consider the case of The Alibi in Portland. The Alibi started using that name in 1947, but it’s been a bar and restaurant for much, much longer, having started as the Chat n’ Nibble in the late 1800s. It got its Polynesian theme gradually over time. It’s hard to pin down which year counts. And then, a personal favorite curiosity… Trad’r Sam, in the sleepy outer avenues of San Francisco. Trad’r Sam was opened by Sam Baylor in 1937, but honestly its history isn’t terribly well documented. It’s just been plugging along as a sturdy, tropical, neighborhood watering hole for generations, quietly under the radar. When people ask me which tiki bar is the oldest, Trad’r Sam is the one I point to. 1937 is right when Hinky Dinks turned into Trader Vic’s and became the bright shining star of the San Francisco Bay Area nightlife scene; the shared Trad’r name sure looks like someone was trying to jump onto someone else’s Polynesian outrigger. Today, Trad’r Sam is more of a loveable dive bar than a temple to the possibilities of tiki, but it’s worth treasuring. So, if we’re putting money on it, I’ll put my money on Trad’r Sam as the oldest tiki bar in the world. The tiki at Tonga Hut never went away, it just suffered for years from the indignity of a sports bar overlay. 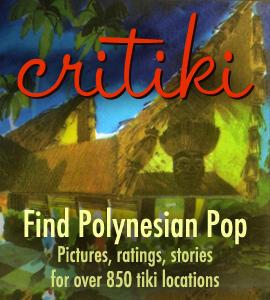 I visited Tonga Hut during its dark years; in my book, it was absolutely still a tiki bar. But, it’s in the eye of the beholder—if Tiki-Ti holds the claim by your measure, I won’t disagree. La Mariana is indeed one of the older places still remaining (it opened in 1955), but others have it beat for longevity. I left out many places that opened in that ’50s-’60s range and are still operating, only selecting a few examples. It’s wonderful that so many of these places are still around! Don the beachcomber in Hollywood was number one, dating back to the early thirties. Yes, that was the original! But it’s been closed for 30 years—this article is only looking at places that are still operating. Damon’s in Glendale, also 1937. Sure, it’s pre-tiki, but so is Trad’r Sam’s. True! The business dates from 1937, but I didn’t include it here because it’s only been in its current location since 1980. Bahi Hut, continuously exactly the same sine 1954. Sven finally referred to it recently as a tiki bar. Whether it is tiki or pre-tiki, it is intact and original.